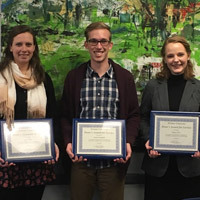 Four individual students have been selected to receive the Dean's Award for Service for Fall semester: Jared Campbell, Megan Price, and Jess Wright at the Webster Groves campus, and Alexis Wing at the Vienna campus. In order to be considered for the Dean's Award one must be nominated by a member of the Webster University community for performing a valuable service, which can encompass a broad range of contributions made by students, both on- and off-campus. Jared Campbell, a senior double major in advertising/marketing communications and theatre studies/dramaturgy from Branson, Missouri, was nominated by John Buck, associate dean of students and director of housing and residence life; Mike Webster, community director for housing and residence life; and Phil Storm, university conduct officer. He was nominated for his coordination of a chalking program the day after the elections for students to express their sentiments, and for his leadership involvement on campus as president of Student Ambassadors, RA in housing and residence life, and Delegates’ Agenda presenter. Megan Price, a junior management major from Joplin, Missouri, was nominated by Billy Ratz, director of parent and student programs in advancement. She was nominated for her work during the campaigns leading up to the local, state, and national elections, and for her leadership involvement on campus, which includes serving as president of College Democrats, SGA senator, and vice president of Student Ambassadors. Jess Wright, a senior international relations major from Orange, Australia, was nominated by John Buck, associate dean of students and director of housing and residence life. She was nominated for her contributions to the planning of the 2nd Global Student Leadership Summit, and for helping her fellow students by bringing issues to the attention of the dean of students office. She is a student from Webster Geneva who is studying abroad in Webster Groves in her last semester before graduating. Alexis Wing, a senior management major at the Vienna campus, from Pasadena, California, was nominated by Jesse Alexander, student community coordinator at Webster Vienna. She was nominated for her leadership involvement on the Vienna campus, which has included serving as SGA vice president, SGA clubs officer, German Club president, and NSO leader.